We are wild beings, with wild instincts. So it seems fitting that while practicing one of our most primitive and beloved instincts—running—we might crave a wild place in which to run. Here are five of Appalachia’s elite ultra champions and race directors sharing their most cherished places to run. Find the best Wilderness Run in your area here! “It was wintertime, and we were trying to cross the Linville River at the Spence Ridge. 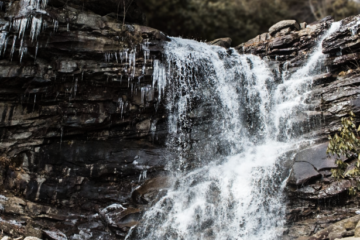 The rocks were covered with ice and the consequence of falling in the water there—we would have probably died,” says Annette Bednosky, recalling a particularly memorable moment in the Linville Gorge Wilderness. She and her friend lived to tell the story, but those feelings of desperation are often part of running in the wild. Bednoksy especially loves the danger and beauty of running in the jagged, gaping, solid-rock Linville Gorge that gouges deep through Pisgah National Forest. It is the third largest wilderness area in the state. Trails are steep and rugged, and the land is accessible only on foot. This is where Bednosky comes to find peace. Bednosky directs the New River Trail 50K, which runs in the New River State Park along an old railroad bed. But unlike her New River Trail 50K, her personal wild runs in the Linville Gorge Wilderness are anything but fast and flat. The gorge is expansive and jarring as you first climb the trails on the ridgelines and peer over into the sheer drops from the rim. Just as when one peers over the edge and into the Grand Canyon for the first time, there is no question that you are looking at something unmistakably wild as you gape at the abyss of the gorge below. Its rocky landscape includes thousands of acres of old-growth forests. Clearly the sport stuck. Bednosky was the second American in the Team USA World Challenge 24-Hour in Italy in 2009, 9th overall in the National Team USA World Championships 100K in the Netherlands in 2011, and the 4th woman in the World Masters Marathon in California in 2011. But when Bednosky is not running around the world, she comes back to Linville Gorge to find solitude in her home wilderness. Here, wild running means dodging rocks, climbing crags, sliding through crevices, running along steep drops, or scrambling across rocky terrain. Wild running means technicality. Wild running means perseverance. The danger element is real, and Bednosky knows it. But that is part of the appeal, and part of the challenge that Linville Gorge Wilderness has to offer. Watch a video of Bednosky explain her passion for running, in her own words. Park at Spence Ridge Trailhead. Run the FS Road to the Table Rock parking lot. Cross through paved parking lot and continue east through the campground and along Mountains to Sea Trail (MST) to Shortoff and beyond. Continue on the MST and prepare for a wet crossing of Linville River. Then run on to Pinnacle Trail and ascend. Head west on Kistler Memorial Highway, a sometimes rutted and steep road with great views. At Connely Cove Trail leave KMH and descend to Linville River Trail (LRT), and follow it west for a short period of time. There are no signs (carry a map), but a short spur trail leaves LRT and goes to the Spence Ridge Trail river crossing access. Once crossing river, follow Spence Ridge Trail back to your vehicle. ROARING PLAINS WEST WILDERNESS, W.Va.
“Dan, you’re going to get somebody killed running up here,” a friend told 61-year-old Dan Lehmann when he brought the first group of people to run the Roaring Plains West Wilderness with him nearly 10 years back. While urging caution, he laughingly admits that not a single person has yet to die while running with him up there. Lehmann didn’t even begin ultra running until his mid 40s. But a lot has changed for Lehmann since then, having completed many ultra runs from 50Ks to 100Ks without yet receiving a single DNF (Did Not Finish). He’s completed nine of David Horton’s vigorous Hellgate 100K races, and even coordinated and ran his own 120-mile trek across the West Virginia Appalachians. On top of being an aggressive runner, Lehmann is an individual full of character. As president of the West Virginia Mountain Trail Runners club, which has cultivated a trail-running community in West Virginia, Lehmann directs his own races, including the 40-mile Highlands Sky Trail Run which crosses through parts of Roaring Plains West Wilderness, the Dolly Sods Wilderness Area, and Canaan Valley. He is no stranger to running in areas that can potentially render a man helpless when running alone. One of Lehmann’s favorite wild runs is in the Roaring Plains Wilderness, a world of strong winds, high elevation, giant boulders, red spruce, and open-brush terrain, perched on the high-elevation plateau in the Monongahela National Forest of West Virginia. The Roaring Plains is a place of grandeur and harsh, wild landscapes. The rocks that have been strewn across the plains and trails of the 4,000-foot plateau beckon injury. Many of these rocks are enormous, still sitting exactly where they were deposited by the colossal strength of the glaciers that left them there eons before. The trees are often flagged and stunted from high-velocity winds—winds that can be as brutal and cold as the stones themselves and deliver powerful and dangerous snowstorms in the winter. The vistas are unbeatable and spread across a plateau where you can run quite far without losing the view. Park at the Red Creek trailhead lot behind the Laneville Wildlife Cabin just past the metal bridge crossing Red Creek at the end on Laneville Road. From the Wildlife Cabin run downstream on Laneville Road and take a hard left on Bonner Mountain Road. Pass the Flatrock Trail parking and continue to the Flatrock Trail on right. The first mile of Flatrock Trail passes through private property and is marked with blue diamonds. After crossing into USFS property and into The Roaring Plains Wilderness most of the blazes are gone. Flatrock climbs for 2,700 feet over five miles and to Roaring Plains and then becoming the Roaring Plains Trail. Here the trail is open, windswept and rocky, with magnificent views. Continue to the gas line and the trail’s end. Turn right, then immediately left on FR 70. Continue on the gravel road and turn left on the Boars Nest Trail. Climb slightly, then descend steeply down 1,000 feet to old railroad grade and turn right. Proceed on the grade to intersect the South Prong trail and bear right. Climb two-and-a-half miles crossing FR 70 and continue up to Red Creek Plains. The trail passes through boulder sections, then the “ten bridges section” through wetlands to emerge at South Prong Trail lot near top of FR 19. Turn left on FR 19 and descend the three miles back to Wildlife Cabin. Francesca Conte co-owns and operates Bad to the Bone Endurance Sports with Russell Gill. She directs a handful of top races, including the Ultra Race of Champions (UROC) 100K. She has finished the Badwater ultramarathon. Known as the ‘world’s toughest foot race,’ Badwater is a 135-mile monster, running from Death Valley to Mount Whitney, Ca. She has won a handful of 100-milers. She has won the USA Track and Field 50-mile Championship. An Italian national, Conte has run in wild places all over the world, yet her favorite runs are in Sugar Hollow, a wild river corridor near Shenandoah National Park. Sugar Hollow is bisected by the North and South Forks of the Moormans River. “For me wilderness is, first and foremost, a place where I can be alone,” she explains. Yet while danger is always present, the trees, the trails, and the river that calmly meanders through Sugar Hollow offers a tranquility that any trail runner can savor. The run begins at Sugar Hollow on the North Fork of the Moormans River Road. Run up the double-track trail that climbs for five miles to the Appalachian Trail. Continue left to head south on the A.T. for nine miles. These nine miles have three major climbs and the terrain is hilly even up on the ridgeline. The A.T. intersects the river at Jarmans Gap and makes a left onto the South Fork of the Moormans River road. The South Fork of the Moormans river road is a double-track trail that follows the South Fork of the Moormans river. It descends for five miles back to Sugar Hollow and the intersection of the North Fork and South Fork of the Moormans river. Clark Zealand is a tough, talented, and thoughtful individual. But you don’t have to know that he’s had 17 career wins and 12 career course records, finished in the top three in nearly all of his races, and set the 5th fastest time in Canadian history for running 100 miles to see that. Or that he directs some of the toughest races in the country through his Eco-X Sports, including the grueling 50-mile Mountain Masochist race. He exudes a tranquility as peaceful as the forest around him. Not suprisingly, he loves to run in one of the most peaceful and remote areas in Virginia: the Ramsey’s Draft Wilderness of George Washington National Forest. “For me, wilderness and wild places are also cultural places,” Zealand said, sitting on the foundation of an old home that once existed in the middle of the Ramsey’s Draft Wilderness. One of his favorite trails passes through an old-growth forest of Canadian hemlocks. Zealand loves ridge-running along the gorgeous pine-lined, snow-coated ridgelines of Ramsey’s Draft. The draft—a regional term for a creek—sings through the valley. He often sees tracks of bears and bobcats along the trails. While he loves to return here, drawn to the incredible beauty of Ramsey’s Draft that ease the tensions of his own life, he does it to ease somebody else’s life too. So at the heart of it all, Zealand often visits wild places to find peace within and bring solace to the fragile mind of a child. Start at the Mountain House parking area of Ramsey’s Draft Wilderness. Run northbound on Ramsey’s Draft Trail to the intersection of Hardscrabble Trail and turn left. Continue onward to the 4,282-foot summit of Hardscrabble Knob with great views from the high-elevation trail along the way. Return to the intersection. Hang a left on Ramsey’s Draft Trail and continue onward to intersection of Shenandoah Mountain Trail where you’ll turn left to head south on Shenandoah Mountain Trail to continue onward to Jerry’s Run Trail. Make another left to head northeast on Jerry’s Run Trail and continue to intersect with Ramsey’s Draft Trail. Take a right on Ramsey’s Draft Trail and follow it back to the parking area to finish this 17-mile circuit. “Listen! What do you hear? You hear the wind. Do you hear any cars? Do you hear any people? Do you hear any traffic? Do you see stop signs? Do you hear any cell phones ringing? Do you hear anybody doing anything? The answer is, no. That’s what I like. I like being out in the mountains, in God’s creation,” David Horton says, gleaming, perched atop highland balds with the wind blowing in his face and the ominous gray clouds sweeping by in his favorite spot at Cold Mountain, Va., in the George Washington National Forest. David Horton is the godfather of ultra running in the South. In 1979 he ran his first ultra marathon. Since then, he’s run 160-plus marathons. He’s set the speed record on the A.T. He’s set the speed record on the Pacific Crest Trail. He’s set the speed record on the Long Trail. He’s directed over 65 ultras and continues to direct the Hellgate 100 each December. Running has defined David’s life—his life up until now, that is. It was. After numerous MRIs, surgeries, and rehabilitations, he found that nothing could be done and that, to his dismay, running was out—for good. But here sat the driven running legend at Cold Mountain in the tawny, bald-mountain grass fields of the fall, talking about his favorite Virginia wilderness where he still comes to let go. Now he finds himself still drawn to his favorite wild spots, pedaling to them instead of running, unable to turn his head away from the great outdoors. What is it that reels him back in every time? The wilderness means two things for Horton. It means sheer beauty and it means self-challenge. The emotion of dramatic landscapes combined with the self-sufficiency that you develop when you have to survive them—that’s what it is about for him. Cold Mountain offers 360-degree views of Mount Pleasant and Mount Pompey in the distance, along with gusty winds and rolling, lullaby-fields. “When I run through here, I think I’m running in The Sound of Music,” Horton said, recalling the iconic scene of Julie Andrews running and spinning through a field in the Alps. But he wasn’t in the Alps. He was atop the Blue Ridge Mountains in Virginia. Start at the Long Mountain Wayside on highway 60 where the Appalachian Trail crosses, about 15 miles west of Amherst, Va. Head north on FS 520 to FS 48 and turn right on 48 taking it to the Henry Lanum Loop Trail. Do the five-mile loop counterclockwise, following FS 48 around the mountain to Salt Log Gap. Follow FS 1176 north for about a mile and turn right on the A.T. Follow the AT back south to Long Mountain Wayside going through Salt Log Gap. Go up and over Tar Jacket Ridge with great views. Descend to Hog Camp Gap at 3,500 feet and then ascend to the open fields of Cold Mountain. Descend to Cow Camp Gap and then ascend to the top of Bald Knob at over 4,000 feet. Then descend 2,000 feet in three miles back to the start and Long Mt. Wayside.